With the wave of medical marijuana dispensaries opening across Colorado, it was inevitable that the creators of “South Park” would tackle the issue. On a new episode entitled “Medical Fried Chicken” airing Wednesday, March 31st, Cartman is outraged when he finds out a medical despensary has taken the place of the towns only KFC. Randy is eager to get his medical marijuana, but is turned away when a doctor finds nothing wrong with him, sending him on a quest to find a medical excuse to smoke marijuana. 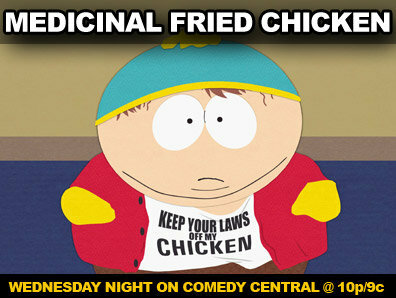 South Park airs Wednesdays at 10/9 Central on Comedy Central.